FIREscape is based around an addressable, emergency lighting control panel with battery back-up and features addressable, self-contained LED luminaires and exit signage connected via screened, extra-low voltage (40V) cabling. Furthermore, FIREscape is a fully self-monitored and self-testing system with a central point of control; making installation and maintenance quick and easy. 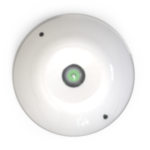 A Simple, Self-Diagnosing Mains-Powered, LED Emergency Lighting Solution. The lighting units and exit signs can be fitted at any location where a connection to the lighting circuit can be made. By combining the existing lighting units with the transformer, a spacer, a mounting base and the integral back-up battery, the resulting self-contained, self-testing unit can provide instant compliance to lighting standards. At the heart of the FIREscape+ system, is an addressable panel that controls both the fire detection and emergency lighting units. Using 40 volt fire resistant screened cable, up to 127 dynamic exit signs, luminaires, fire detection devices, and input/ output units, can be wired onto the same loop. Each device is given an address and the dynamic exit signs are programmed through cause and effect. 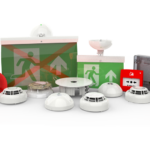 In the event of a fire, the system will automatically determine the state of the dynamic exit signs based on the location of the fire. 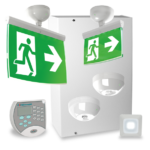 Emergency exit signs will illuminate with a red cross if an escape route is blocked by fire; meanwhile in unaffected areas, exit signs will illuminate with the internationally recognised BS EN ISO 7010 green graphic, to safely guide building occupants to the closest available emergency exit.